Murray Bowen (1931–1990) was the first to study the family in a live-in setting and describe specific details about how families function as systems. Despite Bowen theory being based on research begun more than seventy years ago, the value of viewing human beings as profoundly emotionally-driven creatures and human families functioning as emotional units is more relevant than ever. This book, written by one of his closet collaborators, updates his still-radical theory with the latest approaches to understanding emotional development. Reduced to its most fundamental level, Bowen theory explains how people begin a relationship very close emotionally but become more distant over time. The ideas also help explain why good people do bad things, and bad people do good things, and how family life strengthens some members while weakening others. Gaining knowledge about previously unseen specifics of family interactions reveals a hidden life of families. The hidden life explains how the best of intentions can fail to produce the desired result, thus providing a blueprint for change. Part I of the book explains the core ideas in the theory. Part II describes the process of differentiation of self, which is the most important application of Bowen theory. People sometimes think of theories as "ivory tower" productions: interesting, but not necessarily practical. Differentiation of self is anything but; it has a well-tested real-world application. Part II includes four long case presentations of families in the public eye. 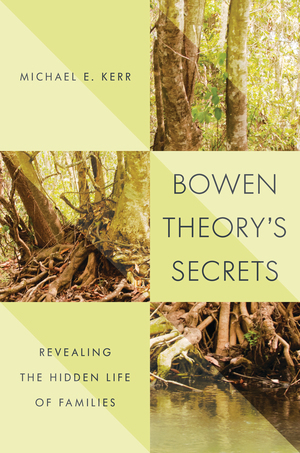 They help illustrate how Bowen theory can help explain how families—three of which appear fairly normal and one which does not—unwittingly produce an offspring that chronically manifests some time of severely aberrant behavior. Finally, the book proposes a new "unidisease" concept—the idea that a wide range of diseases have a number of physiological processes in common. In an Epilogue, Kerr applies Bowen theory to his family to illustrate how changes in a family relationship system over time can better explain the clinical course of a chronic illness than the diagnosis itself. With close to four thousand hours of therapy conducted with about thirty-five hundred families over decades, Michael Kerr is an expert guide to the ins and outs of this most influential way of approaching clinical work with families.